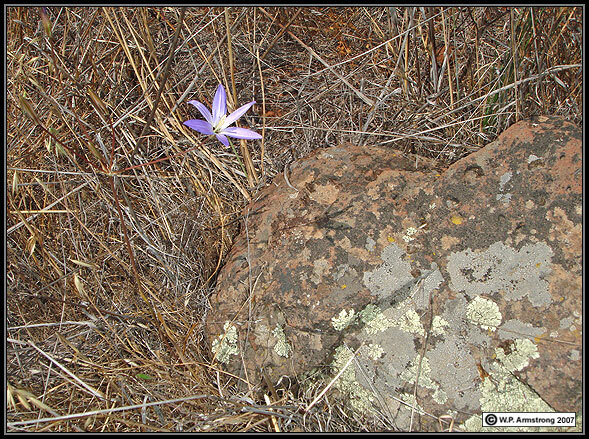 Brodiaea santarosae flower stalk and lichen-covered Santa Rosa Basalt. Brodiaea santarosae flower has longer perianth segments than other Brodiaea species in southern California. 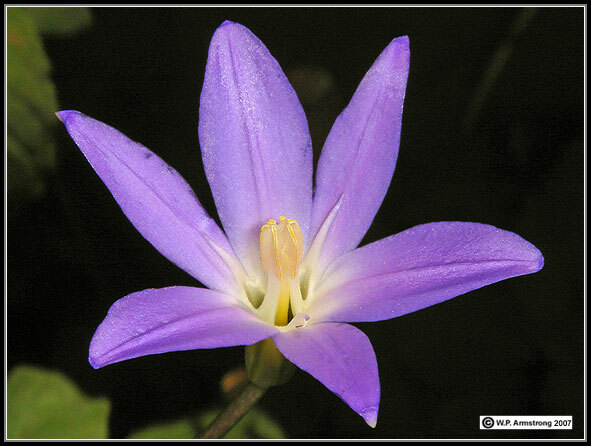 The total spread of this flower is nearly 50 mm. This species has long filaments like B. orcuttii, but has much larger flowers. It has no staminodes or slender staminodes like B. filifolia that vary in length. It is similar to the fertile hybrid between B. filifolia and B. orcuttii, except the flowers are generally about 40 percent larger than the hybrid. 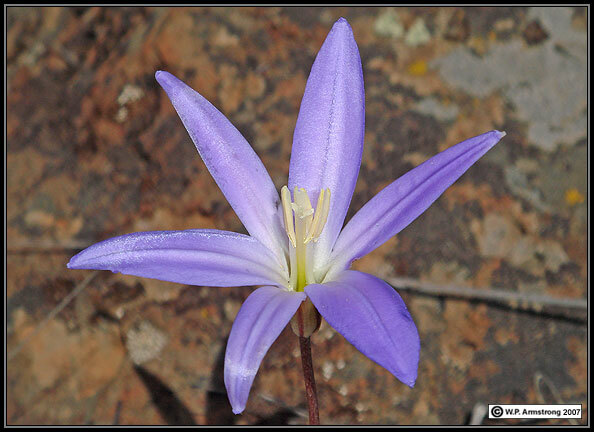 This flower was photographed in June on Avenaloca Mesa during an exceptionally dry spring. 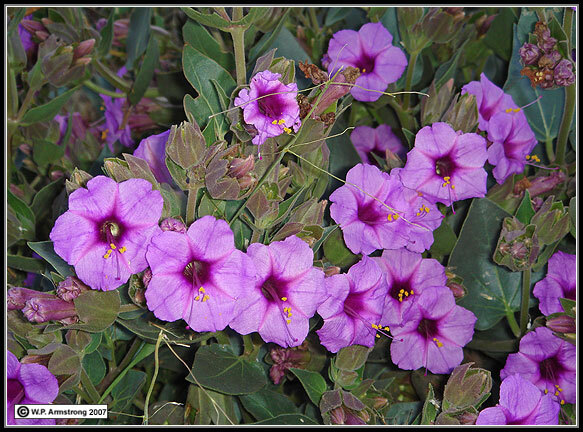 Regularly-watered plants grown in clay soil derived from San Marcos Gabbro developed slightly smaller flowers. Brodiaea santarosae (left) has long, filiform staminodes and long stamen filaments. B. filifolia (right) has much shorter staminodes and very short filaments. 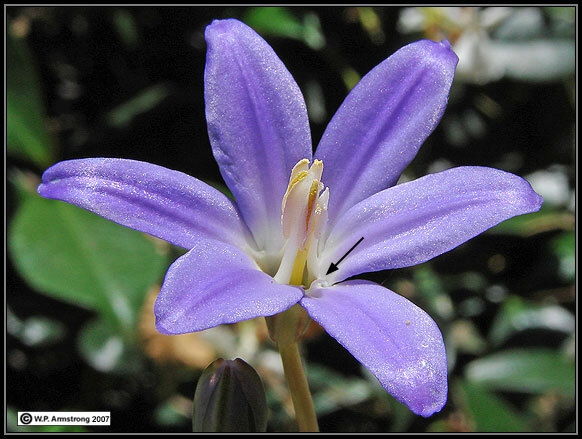 Brodiaea santarosae grown in San Marcos Gabbro from transplanted corm. 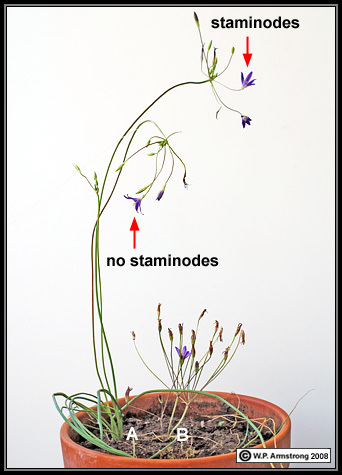 The filiform staminode (black arrow) is similar to B. filifolia. The spreading corolla is 40 mm across, larger than hybrid B. filifolia x B. orcuttii flowers in San Marcos. Flowers of Brodiaea santarosae on Avenoloca Mesa growing in Santa Rosa Basalt have larger flowers with longer perianth segments and spreading corollas 50 mm in diameter. Brodiaea santarosae grown in San Marcos Gabbro from a transplanted corm. The filiform staminodes are much longer than B. filifolia. The long filaments are similar to B. orcuttii. The spreading corolla is 40 mm across, larger than hybrid B. filifolia x B. orcuttii flowers in San Marcos. 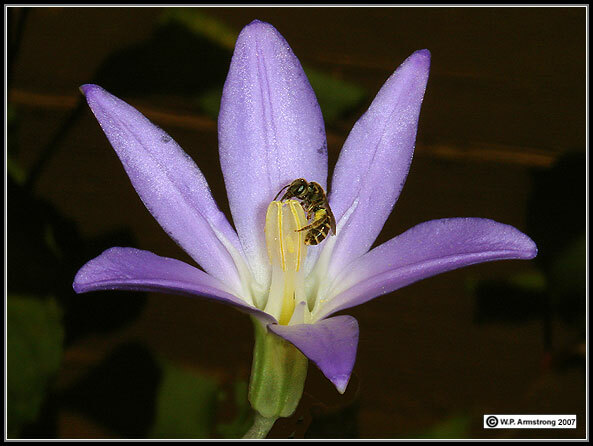 Brodiaea santarosae visited by a small native flower bee of the family Megachilidae. Brodiaea santarosae has the tallest scapes of any in southern California Brodiaea. Between June 7 and June 14 (one week) the scape in this pot grew 18 cm. Between June 7 and June 16 (nine days) it grew a total of 24 cm. This is roughly one inch per day or one millimeter per hour under ideal growing conditions. Fertile hybrid between Brodiaea orcuttii and B. filifolia. It has the long filaments of B. orcuttii and the filiform staminode of B. filifolia (white arrow). The plant was grown in a flower pot in clay soil derived from San Marcos Gabbro. A. Brodiaea santarosae has a perianth spread (diameter) of 40 mm. B. Fertile hybrid between Brodiaea orcuttii and B. filifolia has a perianth spread of 28 mm. Other traits are summarized in the following table. 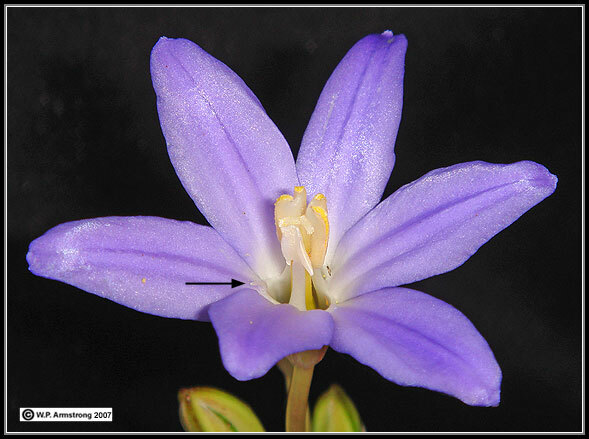 Some dimensions of Brodiaea santarosae flower are smaller than wild populations on the Santa Rosa Plateau. In general, dimensions of the hybrid are slightly larger than individuals growing wild in San Marcos. All dimensions refer to length and are in millimeters. Values in red parentheses from potted plant in 2008. 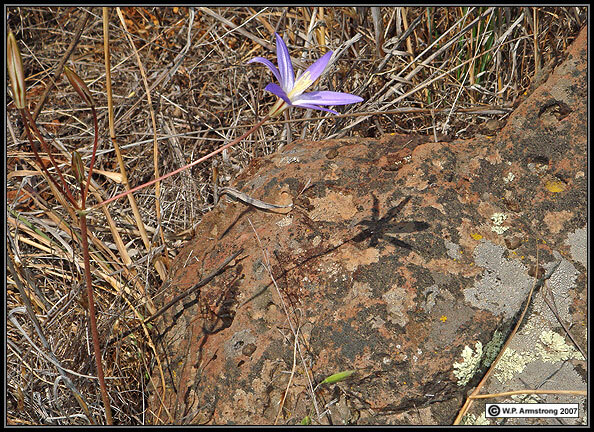 Left: Brodiaea filifolia x B. orcuttii. Right: Brodiaea santarosae. With the exception of pedicel length, all the dimensions for Brodiaea santarosae are much larger than the hybrid. 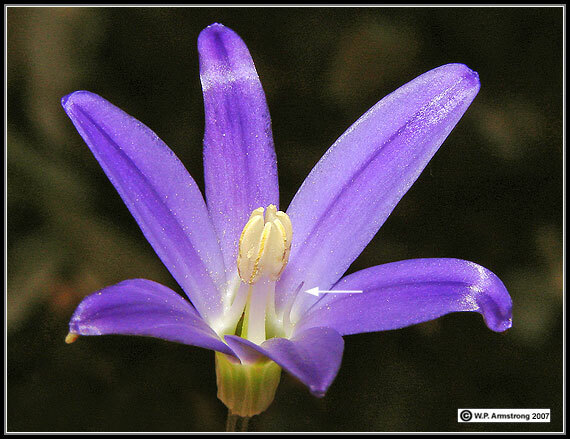 In fact, the leaves of Brodiaea santarosae in the photo are 9.0 mm wide and 55 cm in length. Photo taken in May 2007. 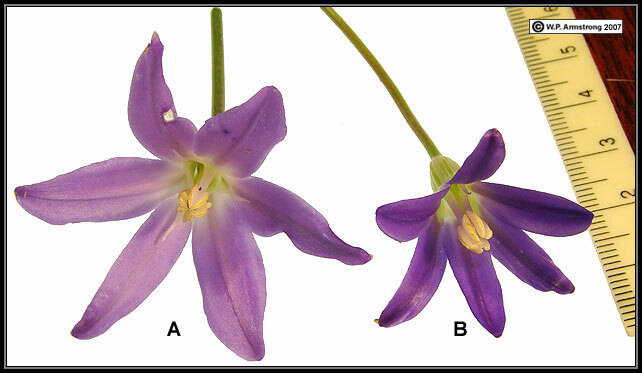 A: Brodiaea orcuttii x B. filifolia. 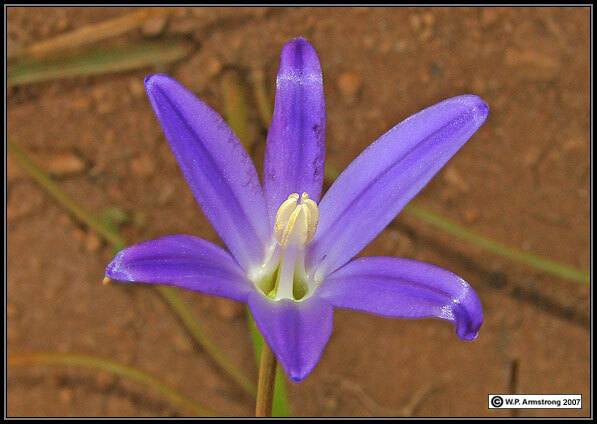 B: Brodiaea terrestris ssp. terrestris. A. 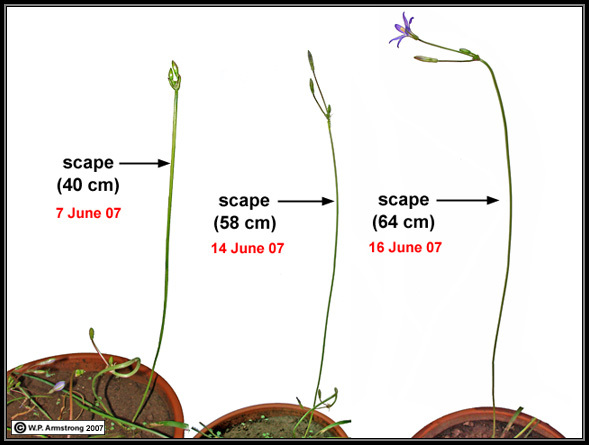 The longest scape (peduncle) for Brodiaea orcuttii x B. filifolia in May 2008 is 610 mm. The perianth lengths are 28-29 mm. These measurements are larger than wild plants in San Marcos. 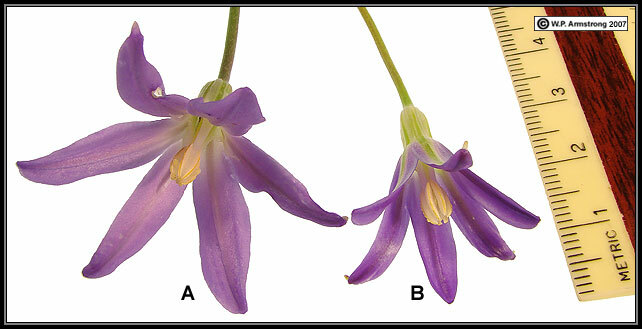 In the photograph, flowers with and without staminodes (red arrows) on are on separate scapes. B. The scape length for B. terrestris ssp. terrestris is 6 mm. 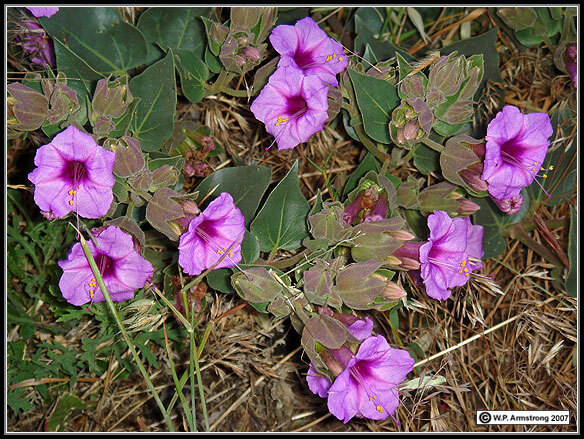 The potted plant has larger flowers than wild plants in the La Panza Range of San Luis Obispo County. 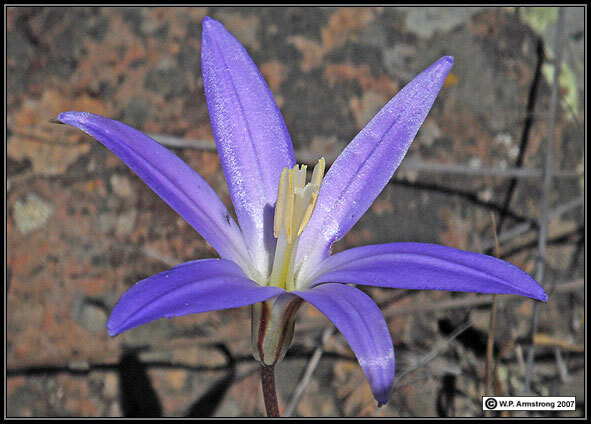 A. Brodiaea santarosae. 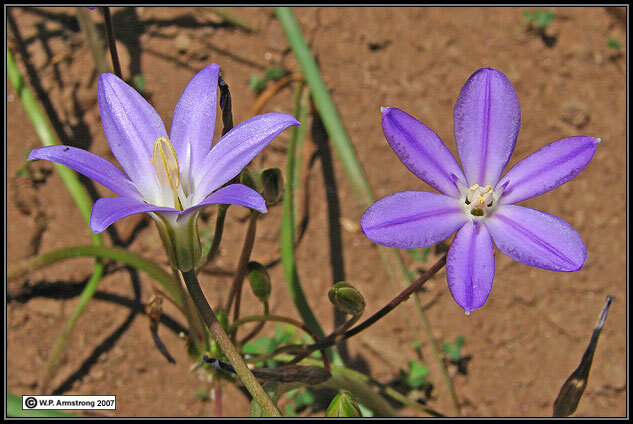 B. Brodiaea filifolia x B. orcuttii. For dimensions of each labeled structure, please refer to the above table. 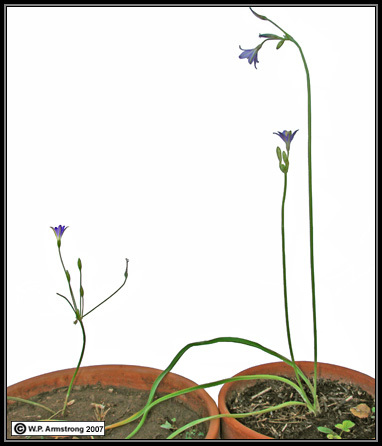 With the exception of filament length, Brodiaea santarosae has larger dimensions. 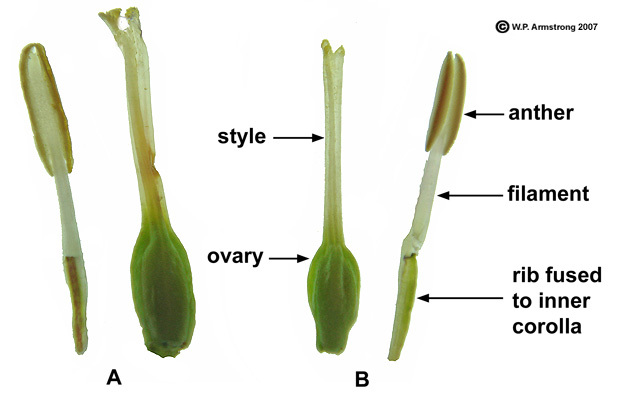 Ovule-bearing ovaries of 3 Brodiaea species: A. Sterile hybrid of B. filifolia or B. orcuttii x B. terrestris ssp. kernensis showing minute aborted ovules. 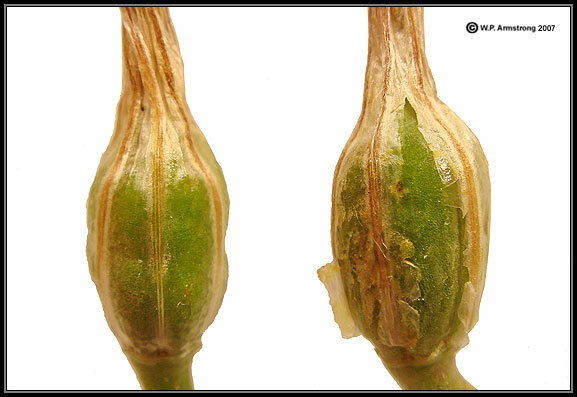 B. Fertile hybrid of Brodiaea filifolia x B. orcuttii showing mature ovules. C. Brodiaea santarosae with mature ovules. The perianth tube of Brodiaea santarosae is thin and transparent. 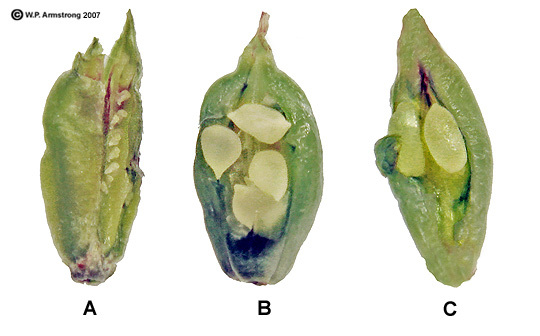 It splits open in fruit just like B. filifolia and B. orcuttii. 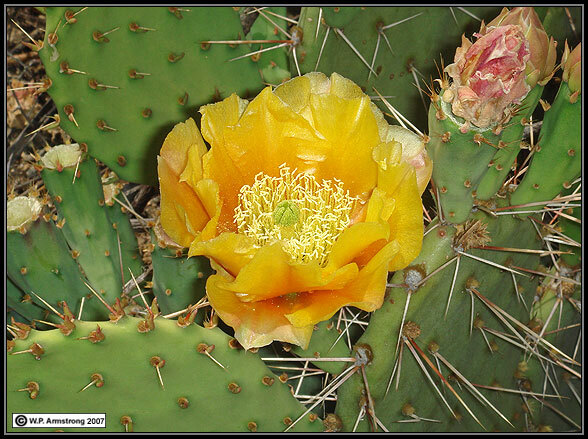 Opuntia vaseyi, listed incorrectly in older references as O. phaeacantha. Snowberry (Symphoricarpos albus var. 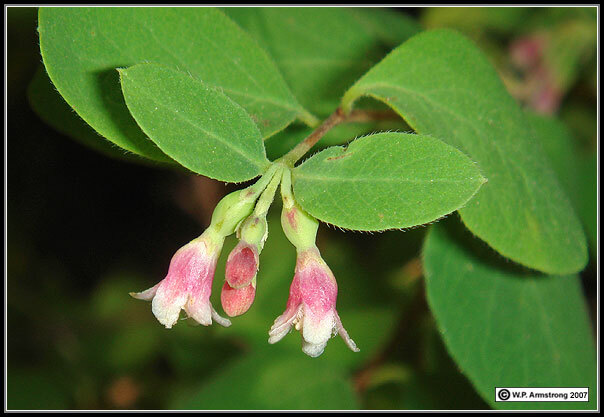 laevigatus), a member of the honeysuckle family (Caprifoliaceae). For many decades this species was misidentified as S. mollis throughout mountains of San Diego County. The latter species occurs in cismontane areas of northern San Diego County and adjacent Baja California. 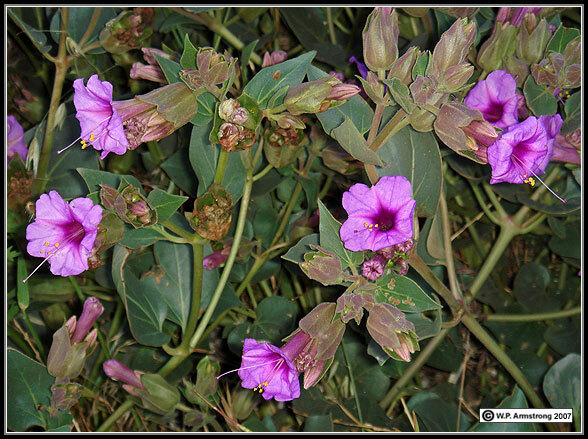 Giant four o'clock (Mirabilis multiflora var. pubescens) along the Laguna Crest Highway. Photo taken with a flash at dusk.